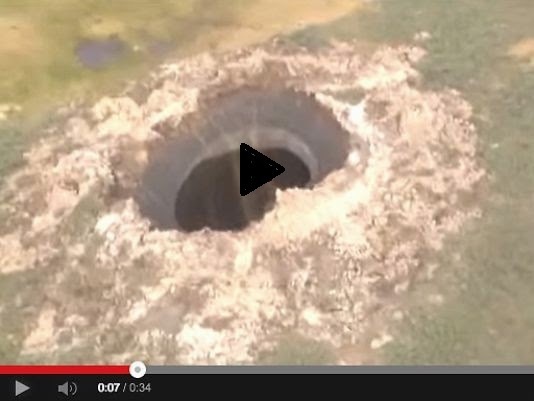 A gaint 60-meter wide crater has appeared suddenly on July 17, 2014 at Yamalo-Nenets Autonomous Area ( Yamal Peninsula ) of Russia. Scientists has confirmed that this was not caused due to any explosions or any meteorite hit. According to scientisits, this occured due to a natural phenomenon that happened due to rising in temperatures of this area and 80 percent of the crater appeared to be made up of ice. They believe that the frozen earth came outwards by powerful pressure from below. Later appearance of a 15 meter wide crater was also reported. The video is shot from a chopper flying above the crater. More researchers are moving to this area to study about this extraordinary phenomenon .